Modern Warfare: Mobilised coming 10th November. Activision announced Call of Duty: Modern Warfare: Mobilised, (yeah quite a mouthful) which is set for a November 10th release date. Developer n-Space will be producing the game, which if you didn't know made Call of Duty: World at War and Star Wars: The Force Unleashed for the humble DS. 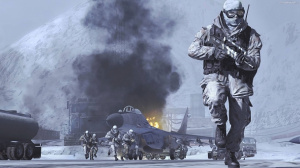 Mobilised will have a unique storyline designed to complement the Modern Warfare 2 campaign. There will also be six-player online battles, and a wave-based survival mode. Once the single player campaign is completed you'll be able to challenge yourself further with Arcade Mode, racing against the clock with a running score. It sounds like quite a meaty package for a DS game, so let's hope n-Space can make a worthy handheld edition of the much-anticipated console game. I'm guessing most people will stick with the Xbox 360/PC/PS3 version. @The FOX: It's a whole new game rather than a port. Comes out the day before my birthday and I really don't care for portable FPS's of the DS, most are horrible and its being made by Activison they screwed up Call of Duty 3, REMEMBER? Sweet! I love the CoD DS games, they're great. i do not like the touch screen use, i want them to do what MPH did with OPTIONS!!! I heard the other ones were decent. Might skip on this one, though. I'll save the FPS's for the consoles, save for Moon and C.O.R.E. Well TreyArch didn't screw up the other Call of Duty games Sephariel. I actually like World at War or 2: Big Red One. Also they at least made Qantum of Solace decent! Yeah, I liked World at War...for the Xbox 360, at least. Can't comment on the DS one, though. Good, it's coming for DS. But this is a bit insulting. No Modern Warfare 2 for Wii? Come on! for crying out loud,sure im happy the DS is getting some love(but doesn't it ALWAYS?) but where's the Wii version?sure medal of honor heroes 2,metroid prime trilogy,the conduit, call of duty 5 would keep some people busy for a tiny while but i want something modern. World at War was a very good DS game, if you need something meaty to take on the road with you this should be a top priority. Obviously if you play your DS at home and have consoles there's no point though. dsi has twice the cpu soeed than the ds lite,though... they should do one just for the dsi,or that the gfx are enhanced at least.